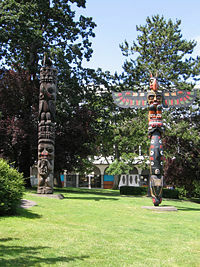 A Gitxsan pole (left) and Kwakwaka'wakw pole (right) at Thunderbird Park in Victoria, British Columbia. Totem poles are monumental sculptures carved from great trees, typically Western Redcedar, by a number of Indigenous cultures along the Pacific northwest coast of North America. The word "totem" is derived from the Ojibwe word odoodem, "his totem, his kinship group" (root -oode). After the movement of European settlers to the region, cultural and religious concepts clashed with those of the indigenous people. Primarily due to ignorance, Christian missionaries and explorers assumed that totem poles where used for worship, banning them as paganism. It was not until the latter part of the twentieth century that the practice and tradition of carving poles was renewed. The beauty and story telling power of the totem pole garnered increase respect and demand throughout Northern America and the world in the late twentieth century and continues to grow in the twenty-first century. The unity of the creation and humankind is one of the most compelling messages conveyed through this artist expression. The beginning of totem pole construction started in North America. Being made of wood, they decay easily in the rain forest environment of the Northwest Coast, so no examples of poles carved before 1800 exist. However eighteenth century accounts of European explorers along the coast indicate that poles certainly existed at that time, although small and few in number. In all likelihood, the freestanding poles seen by the first European explorers were preceded by a long history of monumental carving, particularly interior house posts. Early twentieth-century theories, such as those of the anthropologist Marius Barbeau who considered the poles an entirely post-contact phenomenon made possible by the introduction of metal tools, were treated with skepticism at the time and are now discredited. Eddie Malin (1986) has proposed a theory of totem pole development which describes totem poles as progressing from house posts, funerary containers, and memorial markers into symbols of clan and family wealth and prestige. He argues that the center of pole construction was the Haida people of the Queen Charlotte Islands, from whence it spread outward to the Tsimshian and Tlingit and then down the Pacific Coast to the tribes of British Columbia and northern Washington state. The regional stylistic differences between poles would then be due not to a change in style over time, but instead to application of existing regional artistic styles to a new medium. Totem poles in front of houses in Alert Bay, British Columbia in the 1900s. The disruptions following Euro-American trade and settlement first led to a florescence and then to a decline in the cultures and totem pole carving. The widespread importation of Euro-American iron and steel tools led to much more rapid and accurate production of carved wooden goods, including poles. It is not certain whether iron tools were actually introduced by Europeans, or whether iron tools were already produced aboriginally from drift iron recovered from shipwrecks; nevertheless Europeans simplified the acquisition of iron tools whose use greatly enhanced totem pole construction. The fur trade gave rise to a tremendous accumulation of wealth among the coastal peoples, and much of this wealth was spent and distributed in lavish potlatches frequently associated with the construction and erection of totem poles. Poles were commissioned by many wealthy leaders to represent their social status and the importance of their families and clans. Totem pole construction underwent a dramatic decline at the end of the nineteenth century due to American and Canadian urges towards Euro-American enculturation and assimilation. Christian missionaries reviled the totem pole as an object of heathen worship and urged converts to cease production and destroy existing poles. Also, as the fur trade declined the incidence of poverty on the coast increased, reducing the incidence of totem pole construction. Fortunately, in the mid-twentieth century a combination of cultural, linguistic, and artistic revival along with intense scholarly scrutiny and the continuing fascination and support of an educated and empathetic public led to a renewal and extension of this moribund artistic tradition. Freshly-carved totem poles are being erected up and down the coast. Related artistic production is pouring forth in many new and traditional media, ranging from tourist trinkets to masterful works in wood, stone, blown and etched glass, and many other traditional and non-traditional media. Today a number of successful native artists carve totem poles on commission, usually taking the opportunity to educate apprentices in the demanding art of traditional carving and its concomitant joinery. Such modern poles are almost always executed in traditional styles, although some artists have felt free to include modern subject matter or use nontraditional styles in their execution. The commission for a modern pole ranges in the tens of thousands of dollars; the time spent carving after initial designs are completed usually lasts about a year, so the commission essentially functions as the artist's primary means of income during the period. Poles of all types share a common graphic style in which symbolic animals and spirits are represented. Two distinct systems of art were developed for two-dimensional and three-dimensional figures, but both were maintained within the common graphic style. This style was developed by Northwest Coast Native Peoples over many thousands of years, as evinced by stone and bone artifacts uncovered in archaeological studies which display clear examples of the same design motifs. The meanings of the designs on totem poles are as varied as the cultures which produce them. A totem is any animal, plant, or other object, natural or supernatural, which provides deeply symbolic meaning for a person or social group. A totem is revered and respected, but not necessarily worshipped. Totem poles may recount familiar legends, clan lineages, or notable events. Some poles are erected to celebrate cultural beliefs, but others are intended mostly as artistic presentations. Certain types of totem pole are part of mortuary structures incorporating grave boxes with carved supporting poles, or recessed backs in which grave boxes were placed. Poles are also carved to illustrate stories, to commemorate historic persons, to represent shamanic powers, and to provide objects of public ridicule. Some of the figures on the poles constitute symbolic reminders of quarrels, murders, debts, and other unpleasant occurrences about which the Indians prefer to remain silent… The most widely known tales, like those of the exploits of Raven and of Kats who married the bear woman, are familiar to almost every native of the area. Carvings which symbolize these tales are sufficiently conventionalized to be readily recognizable even by persons whose lineage did not recount them as their own legendary history. (Reed 2003). Totem poles were never objects of worship; the association with "idol worship" was an idea from local Christian missionaries. The same assumption was made by very early European explorers, but later explorers such as Jean-François de La Pérouse noted that totem poles were never treated reverently; they seemed only occasionally to generate allusions or illustrate stories and were usually left to rot in place when people abandoned a village. The vertical order of the images is widely believed to be a significant representation of importance. This idea is so pervasive that it has entered into common parlance with the phrase "low man on the totem pole." This phrase is indicative of the most common belief of ordering importance, that the higher figures on the pole are more important or prestigious. A counterargument frequently heard is that figures are arranged in a "reverse hierarchy" style, with the most important representations being on the bottom, and the least important being on top. Actually there have never been any restrictions on vertical order, many poles have significant figures on the top, others on the bottom, and some in the middle. Other poles have no vertical arrangement at all, consisting of a lone figure atop an undecorated column. The poles used for public ridicule are usually called "shame poles," and were erected to shame individuals or groups for unpaid debts. Shame poles are rarely discussed today, and their meanings have in many places been forgotten. However they formed an important subset of poles carved throughout the nineteenth century. 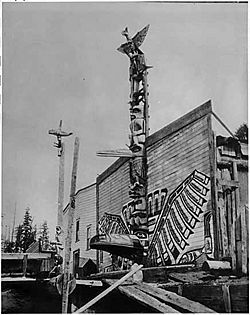 One famous shame pole is the Lincoln Pole in Saxman, Alaska; it was apparently created to shame the U.S. government into repaying the Tlingit people for the value of slaves which were freed after the Emancipation Proclamation. Other explanations for it have arisen as the original reason was forgotten or suppressed, however this meaning is still clearly recounted by a number of Tlingit elders today. Shakes Island in Wrangell. The Three Frogs pole is visible on the far right. Another example of the shame pole is the Three Frogs Pole in Wrangell, Alaska. This pole was erected by Chief Shakes to shame the Kiks.ádi clan into repaying a debt incurred by three of their slaves who impregnated some young women in Shakes' clan. When the Kiks.ádi leaders refused to pay support for the illegitimate children Shakes had the pole commissioned to represent the three slaves as frogs, the frog being the primary crest of the Kiks.ádi clan. This debt was never repaid, and thus the pole still stands next to the Chief Shakes Tribal House in Wrangell. This particular pole's unique crossbar shape has become popularly associated with the town of Wrangell. It was thus used, without recognizing the meaning of the pole, as part of the title design of the Wrangell Sentinel newspaper, where it is still seen today. The construction of shame poles has essentially ceased within the last century. This is attributable to a decline in interclan rivalries and clan relationships in general, and to a desire for solidarity among most native tribes. However, as feelings of independence and nationalism increase among Northwest coast people, erecting shame poles against the American and Canadian governments has been occasionally proposed, though usually in a facetious manner. If outrage against some political decision is strong enough among the people of a particular Northwest coast tribe the erection of a new shame pole may again become a possibility, although the cost of construction will likely be a major inhibition. A shame pole was erected in Cordova, Alaska on March 24, 2007. It includes the inverted and distorted face of Exxon ex-CEO Lee Raymond. representing the unpaid debt that courts determined Exxon owes for having caused the oil spill in Valdez, Alaska. 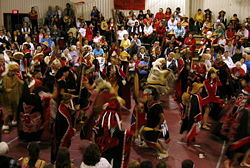 Dancing at a pole-raising celebration in Klawock, Alaska. Erection of a totem pole is almost never done using modern methods, even for poles installed in modern settings on the outside of public and private buildings. Instead the traditional ceremony and process of erection is still followed scrupulously by most artists, in that a great wooden scaffold is built and hundreds of strong men haul the pole upright into its footing while others steady the pole from side ropes and brace it with cross beams. Once the pole is erected a potlatch is typically held where the carver is formally paid and other traditional activities are conducted. The carver will usually, once the pole is freestanding, perform a celebratory and propitiary dance next to the pole while wielding the tools used to carve it. Also, the base of the pole is burnt before erection to provide a sort of rot resistance, and the fire is made with chips carved from the pole. Totem poles are typically not well maintained after their erection. Traditionally once the wood rots so badly that it begins to lean and pose a threat to passersby, the pole is either destroyed or pushed over and removed. Older poles typically fall over during the winter storms that batter the coast. A totem pole rarely lasts over 100 years. A collapsed pole may be replaced by a new one carved more or less the same as the original, with the same subject matter, but this requires a new payment and potlatch and is thus not always done. The beliefs behind the lack of maintenance vary among individuals, but generally it is believed that the deterioration of the pole is representative of natural processes of decay and death that occur with all living things, and attempts to prevent this are seen as somehow denying or ignoring the nature of the world. This has not, however, prevented many people from occasionally renewing the paint on poles or performing further restorations, mostly because the expense of a new pole is beyond feasibility for the owner. Also, owners of poles who are not familiar with cultural traditions may see upkeep as a necessary investment for property, and ignore the philosophical implications. Artisans of totem pole carving have increased since the revival period of the 1970s. Totem poles are commissioned by individuals and public entities. Usually the time frame of completion is about a year. Many artists have websites or are featured on museum websites. Henry Green, for example, a Coastal Tsimshian of the Eagle Clan, is featured on a website that received permission for the Quintana Gallery for the use of Green's biography. In early July of 2002, Lummi tribal member Jewell Praying Wolf James (Indian Name: tse-Sealth, a lineal descendant of Chief Seattle) began carving an old growth cedar log donated by Crown Pacific Limited Partnership of Portland, Oregon. Mr. James, a Northwest Coast Spirit Dancer, master carver and President of the House of Tears Carvers, volunteered to carve a traditional Healing Pole to be placed on September 7 in Arrow Park, in the Sterling Forest, on an 80-acre site dedicated to the memory of those who were killed at the World Trade Center. The 20,000-acre Sterling Forest, one hour north of Manhattan, is the sister forest of the Arlecho Creek forest, located one hour north of Seattle in Washington State. The House of Tears Carvers have participated in international peace work through the Middle East Peace Initiative as Ambassadors for Peace and began carving a totem pole of the reconciliation of the brothers Cain and Abel. They also presented a totem pole that was erected at the founding of the National Museum of Native American History in Washington D.C. in 2005. The Kiks.ádi pole in Wrangell, Alaska. Each culture typically has complex rules and customs regarding the designs which are represented on poles. The designs themselves are generally considered the property of a particular clan or family group, and this ownership may not be transferred to the owner of a pole. As such, pictures, paintings, and other copies of the designs may be an infringement of posessory rights of a certain family or cultural group. Thus it is important that the ownership of the artistic designs represented on a pole are respected as private property to the same extent that the pole itself is property. Public display and sale of pictures and other representations of totem pole designs should be cleared with both the owners of the pole and the cultural group or tribal government associated with the designs on the pole. However totem poles in general are not the exclusive cultural property of a single culture, so the designs are not easily protected. The appropriation by art and tourist trinket worlds of Northwest Coast American culture has resulted in, among other things, an inundation of cheap imitations of totem poles executed with little or no knowledge of the complex stylistic conventions demanded by Northwest Coast art. This proliferation of "totem junk" has diluted the public interest and respect for the artistic skill and deep cultural knowledge required to produce a pole. In the early 1990s, the Haisla First Nation of the Pacific Northwest began a lengthy struggle to repatriate a sacred totem from Sweden's Museum of Ethnography. Their successful efforts were documented in a National Film Board of Canada production by Gil Cardinal. Victoria's "World's Tallest Totem Pole." There are disputes over which is genuinely the tallest, depending on constraints such as construction from a single log or the affiliation of the carver. The 173 feet tall totem pole in Alert Bay is comprised of two pieces of 168 and 5 feet. Competition for making the tallest pole is still prevalent, although it is becoming more difficult to procure trees of such heights. The thickest totem pole ever carved to date is in Duncan, British Columbia, carved by Richard Hunt in 1988, and measures over 6 ft (1.8 m) in diameter. It is carved in the Kwakwaka'wakw style, and represents Cedar Man transforming into his human form. Poles similar to totem poles are also found elsewhere in the world. Two notable cultures with such example of having a totem pole-like objects are those by the Māori of New Zealand and the Ainu of Hokkaidō, northern Japan. Bottom of an old totem pole on the grounds of the UBC Museum of Anthropology. Wawadit'la with heraldic pole, built by Chief Mungo Martin in 1953 at Thunderbird Park in Victoria, British Columbia, Canada. From left to right, the One-Legged Fisherman pole, the Raven pole, and the Killer Whale pole in Wrangell, Alaska. Totem poles at the Museum of Anthropology at the University of British Columbia. Several Totem poles in Victoria British Columbia outside the Royal BC Museum. ↑ Alex Demarban, Shame pole unveiled on anniversary of Exxon Valdez spill,Associated Press, March 24, 2007 . Retrieved December 16, 2015. ↑ Quintana Gallery, Henry Green, Tsimshian Nation Retrieved December 16, 2015. ↑ U.S. National Library of Medicine, About the Artist Healing Voices. Retrieved December 16, 2015. ↑ Na na kila Insititute G'psgolox Pole is home! Retrieved August 23, 2007. ↑ National Film Board of Canada Production Totem: The Return of the G'psgolox Pole Retrieved August 23, 2007. This page was last modified on 16 December 2015, at 21:30.